In Hong Kong, pop-up stores are not exclusive to the designer goods industry. Amid notoriously expensive monthly rents, soaring shop vacancies, and a struggling retail industry, the concept of leasing short-term retail spaces, along with their salespeople, has taken root as a strategy to sell inexpensive household products in the grassroots and middle-class neighborhoods of Hong Kong, and has become a unique and integral part of everyday life in Hong Kong. For an ordinary housewife like Ms Yeung, making a trip to Ap Liu Street electronics market in Sham Shui Po can be a real chore. Upon exiting the MTR station, she quickly covered her nose and mouth and darted away from the smokers standing by the trash can. A sharp, pungent smell of curry satay entered the formula, managing to make any stomach growl. She navigated briskly through the crowds, dodging any sauce-dripping fishball skewers at eye level. Usually, the overwhelming sensory experience would keep her on her toes, but this time, the deals that street promoters were touting caught Yeung’s eye. Equipped with a headset microphone and a mini sound system by their feet, the saleswomen spoke in endless flowing sentences in a conversational tone, while demonstrating their products to a crowd of middle-aged shoppers that had gathered spontaneously at the front of the tiny shop space. Passersby looked up from their phones and peered over their shoulders out of fear that they would miss out on a good deal. The goods the saleswomen were hawking included everyday household items like ceramic knives that cut through towels like butter, food blender with switchable blades, and ceramic pots that allow for oil-free cooking. Not far away from the food blender shop, another store selling an assortment of cookware has attracted an audience of its own. Ten elderly people listened intently to the store’s promoter, a man in his thirties who spoke robotically, as if he had done the routine too many times, while customers of the bubble tea takeaway next door looked on. Brick-and-mortar retail stores may be turning into the dinosaurs of the Internet age. In the past 11 months alone, the United States has announced over 6300 store closures; several household names have filed for bankruptcy in the last few years: Blockbuster, Radio Shack, and most recently, Toys R’ Us. But for Hong Kong, affordable short-term rentals and charismatic salespeople at Kowloon’s cramped store fronts are part of the evolution that is helping these pop-up stores survive the digital revolution. Though online shopping is becoming more popular among Hong Kong consumers, the city still lags behind other well-developed economies. Government statistics show that 23 percent of Hong Kong people had shopped online in the previous 12 months in 2014—a 7 per cent increase from 2009—while the figure for mainland China was 67 percent in 2014, 78 per cent for the United States, and 81 per cent for the United Kingdom. Fear of online shopping could be a reason for the city’s low adoption rate. In a 2016 survey by the Consumer Council, 30 percent of the 1010 respondents said they do not shop online because they fear that their personal data might be leaked, and 22 percent say they have “no confidence” in the quality of the products they purchase online. The salespeople at the pop-up stores in Hong Kong, however, work to put those fears to rest. Even if it meant putting on a live informercial on a narrow sidewalk. 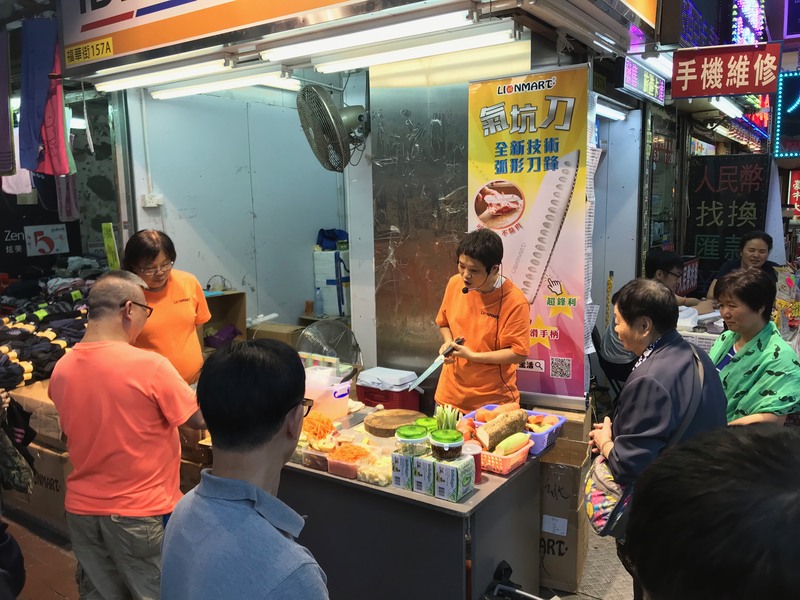 At the food blender shop on a busy street corner of Kwei Lin Street, a middle-aged saleswoman in a neon orange company t-shirt paced around the cramped shop front. She held the blender she had been showing her customers upside down and cleared the food scraps into a trash bin. In front of her were pre-soaked soy beans, pre-cut apples and beets, all neatly arranged in individual plastic containers. As a growing crowd looked on, the saleswoman gave them a choice of seeing her make soy milk or beet and apple juice with the blender. Before anyone could give an answer, she said, “Should we go with beet juice? Beets are very popular nowadays. You know what they can do? They can prevent cancer.” She pointed to a black-and-white photocopy of a Chinese newspaper article taped to the wall behind her. The headline read—in bold—BEETS CAN PREVENT CANCER. People in the crowd raised their eyebrows. “Yes, I kid you not, they can prevent cancer,” she said, reassuringly. “So to make beet juice, you just need 30 seconds. It’s that easy.” The saleswoman secured the fruit-filled cup to the bottom of the machine. It whirred. “Give it 30 seconds,” she said, speaking over the noise. When it was done, she held it up to her audience and a few women came forward to smell it. “It smells very rich and strong, doesn’t it? You can see for yourself.” She then poured the purple mixture over her hands and into a bowl. Sounding as if she was an older girl showing off a tried-and-true makeup regimen to her younger friends at a sleepover, she said, “Look, it’s very smooth. No residue.” Some people nodded in approval to each other. A few members of the audience, including Yeung, walked over to the promoter’s colleague to buy a set of blenders and blades, their cash stashed in a flimsy cardboard box held together by clear tape. Behind the brightly-lit countertop where the saleswoman proceeded to blend soy milk stood a crudely designed banner with an enlarged photo of the product and large wordings —a display that could have been made with Microsoft Word. The retail space itself is not a backdrop that you would expect a savvy salesperson to be in— plain white fluorescent-lit walls and a bare concrete floor, stockpiled with merchandises and toppled boxes in plain sight. The space may look like it is still up for rent — its facade is plastered with red and yellow “to-let” ads. To fill soaring retail vacancies resulted from a lack of demand for expensive long-term retail leases, landlords offer short-term leases at more affordable daily or weekly rents. According to an ad posted on “Boss38”, an online forum for local entrepreneurs, the daily rate for a 48-square-feet retail space in Cheung Sha Wan can go as low as $300. The price varies depending on the district and its proximity to major streets or transport hubs. 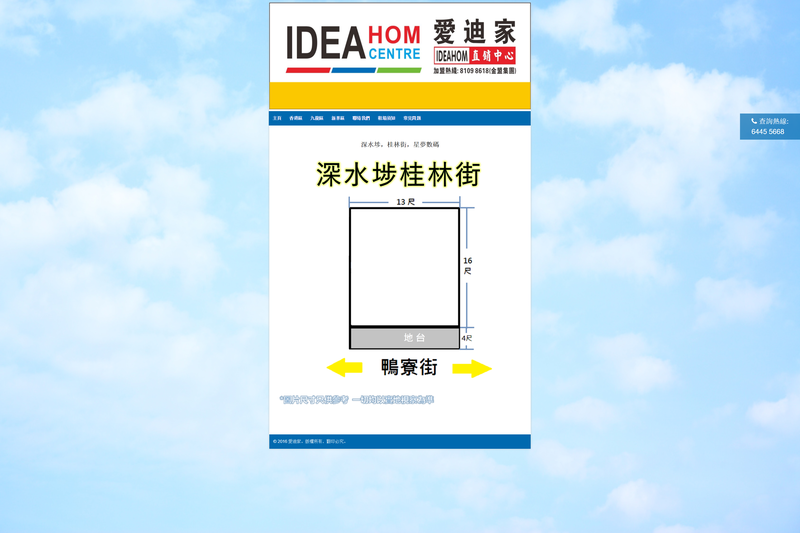 An online advertisement for one of the subdivided shop spaces pictured above. This is also the same space that the food blender vendors rented. The measurements for the shop space is 13 feet by 16 feet, plus an extra 13x4 square feet raised platform at the store front. In some cases, like the blender shop, the space is partitioned and leased to three to four pop-up vendors at an even lower price. This is akin to subdividing flats and leasing them at lower rents in many of Sham Shui Po’s tenement buildings, a controversial practice that has put space-starved Hong Kong in the international limelight because of its inhumane and unsafe living conditions. With the space leased to different vendors every few days, the minimal furnishing is more for convenience when moving out than for achieving a certain aesthetic. It serves as a bare canvas to market any kind of product—there could be a promoter selling quick-dry mops today, and another promoting handheld clothes steamers tomorrow. 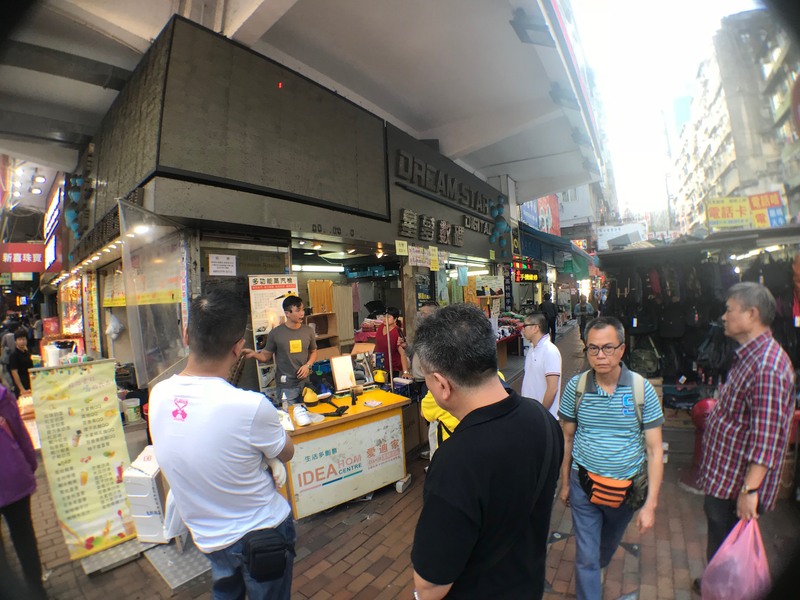 Kwei Lin Street, Sham Shui Po: A shop space that used to be an electronics store (its signage still intact) is now subdivided and leased to 4 different vendors selling local snacks, clothes steamers, sim cards, and inexpensive clothing. However, the impermanence of these shops could mean less protection for its customers, as the store may have already been leased to another vendor by the time they discover a problem. Those who are unhappy with their purchases would often have to call or seek help in person at the brand’s offices, which may be located far away from the neighborhood pop-up stores. In 2016, the city’s Consumer Council said it had received 105 complaints relating to kitchenware, half of which concern product quality. 17 new complaints about cookware have been lodged in the first two months of 2017. In January this year, complainant Miss Hui said she was at a crowded pop-up store and paid $500 to show—in the words of the promoter—”her sincerity” in exchange for a ceramic pot and a bag of kitchenware which the promoter claimed were rewards for her spreading the word about the product in due course, only to discover that the pot had scratches and visible dents when she got home. When she went to return the products at the shop the next day, the salespeople were no longer there. After receiving Hui’s complaint, the Council sent a letter to the company’s address and called the number on its business card but received no response. It advised Hui to follow up her case through legal channels, though she acknowledged that it would be difficult to recover the loss that a moment of weakness had cost her. She hoped that the Council would pay more attention to similar marketing tactics in the future. Hui was not alone. In May 2015, a Facebook page called “Hong Kong Break the Law” published a photo album titled “Ceramic Pot Scam” that contained candid photos and videos of ceramic pot salesmen at various locations around the city. The post has since garnered over 200 comments, many of which are claims like Hui’s, detailing experiences with promoters that employ similar marketing tactics in Shau Kei Wan, Tsuen Wan, and Sheung Shui. The elderly people edged closer to the salesman’s work table, with some reaching out to the bags. But he withheld them and carried on with his demonstration. “Is there anyone who cooks at home?” he asked. “Yes,” said some members of the audience. Multiple hands shot up with wallets in clear view. The salesperson proceeded to use almost the same strategy, but this time telling people to take out five hundred-dollar bills. A short-haired lady in a pink shirt handed him some cash from her wallet. “Why is she so eager? I don’t want your money. I only want to know if you really want it. You have to take it out,” he said. His “speech” had been going on for over 30 minutes, but he never mentioned the idea of “paying” for the products he was promoting. Rather, he repeatedly made the distinction of showing him money to “prove” an “eagerness” to try the cookware, versus paying him for the products. Eventually, he convinced three people, a man and two women, including the one in pink, to pay him in exchange for the black plastic bag of “gifts”. Once the transactions were made, the crowd dispersed. The male customer, an elderly person wearing a white vest and khakis, muttered under his breath, “There goes 500 dollars.” Back at the shop, the vendor lit a cigarette while his assistant, a young girl in her teens, who had been standing behind him the entire time, threw away the egg inside the pot and restocked the counter top with kitchen towels. The customer in pink emerged from the back alley next to the store. It had been ten minutes since she made her purchase and left the shop. She left the black plastic bag of goods, which had the large box containing the ceramic pot she bought earlier, on the steps of the shop front. The teenage girl hurriedly shoved some dollar bills into her hands. Looking left and right, the women in pink scurried off to the Jockey Club betting branch on the opposite side of the street, joining a group of elderly people who were looking at the newest football match scores on oversized LED displays.